Saute cauliflower rice until toasted and golden brown, set aside. Chop beet, sweet potato, and onion and drizzle with avocado oil or bacon fat. Roast on broil for 5-10 minutes. To create the bowl scoop cauliflower rice and beans for the bottom of the bowl. Layer with mixed greens. Top with roasted vegetables, avocado and garnish. Drizzle with avocado cilantro sauce. This will make enough for several servings. Just keep in an airtight container in your fridge! Blend all ingredients above until smoothe and creamy consistency. 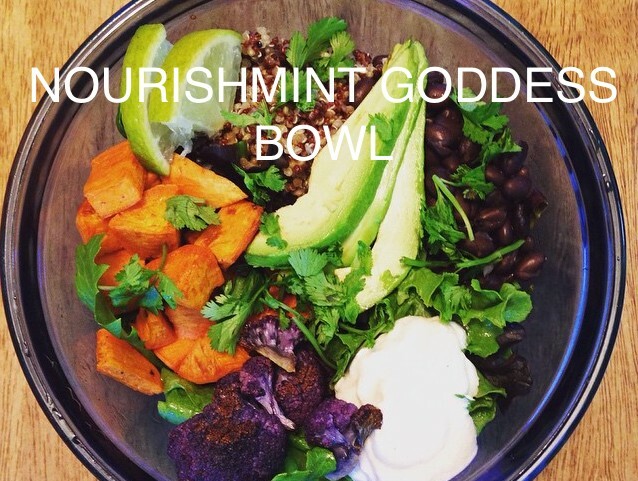 Drizzle over goddess bowl and enjoy!